Happy Monday! Today will be a little bit of a rough one, as I'm headed back into a full week of school after a wonderful (last) Spring Break. The beginning of my break was spent in Orlando (full recap of the vacation coming tomorrow! ), and this past weekend my mom came to Charlotte to help me and my future roommate look for apartments. We lucked out and found one that fit our budget and had most of the things that we were looking for!! Provided that we pass the last part of the approval process this week, we will get to move in a lot earlier than expected, which is so exciting! I'm thrilled to have more time than I expected to slowly move out of my dorm room- ha! 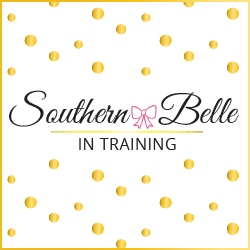 My restyled outfit posts are always a hit here on Southern Belle in Training, so I thought that it would be fun to kick off the week by sharing one. The shorts that I'm wearing were previously featured in this post from last summer, and my top was previously featured in this post from the fall. I had never styled both pieces together before now, but this outfit is just a perfect example of how you can continually shop your own closet to create new looks with items that you already own! Have a great start to your week, and thanks for reading! P.S. The giveaway that I'm hosting with Pink Blush ends tomorrow- so be sure to enter if you haven't yet! This is adorable! I love it! I love this look for spring! I especially like those sandals! I love changing looks up! I have a similar pair of shorts that I wear with so many different things, it's great! and you look fabulous, as always. Very cute!! I love the simple pink look. Everything about this outfit is so cute!! 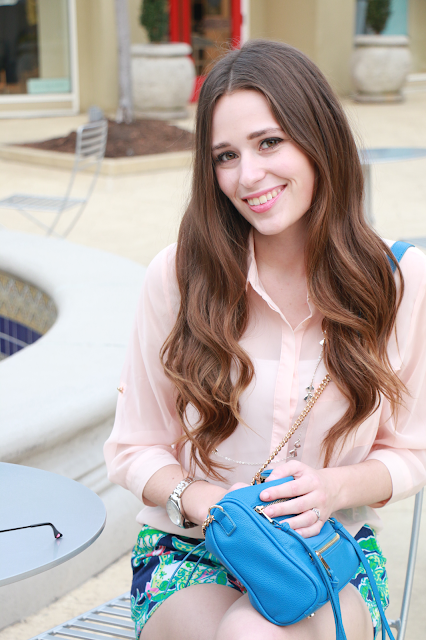 I love reading restyled looks from bloggers, it's a great way to find more use for pieces in your closet! I'm excited to read your Spring break recap! Love this outfit and that necklace! Yay for getting your apartment earlier than expected. I love the combination of the pastel shirt and the bold colors of the shorts! These shorts are so cute, Annaliese! Congrats on finding an apartment! Such a fun and bright outfit! Such a great spring outfit. Your hair looks stunning! I love this restyling look of the shorts! Perfect for the spring and summer months. I am loving this look! Can't wait to break out my Lilly shorts! I love this outfit. Also your hair looks incredible! You look fantastic! I adore those shorts and that necklace! I want your hair btw, it's perfect! Your shorts are too cute! I don't know that I would be able to pull them off but I love how you styled them. I love how you remix outfits on your blog, it makes you so much more relatable than bloggers who wear something different every single day! Love those shorts as well, do you remember the print name? So cute! I have those same shorts and can't wait to style it with a blouse that color now! How to Run a Successful Blog While in College. Best Easter Sales + Current Wishlist. Link-Up: 2016 NPC Badge Day! A Spring Break State of Mind. 21st Birthday Wishes with Top Shelf.